OpenText Conversions from MO Optical Disk storage Tower systems to export scanned document image files to PDF or TIF files. 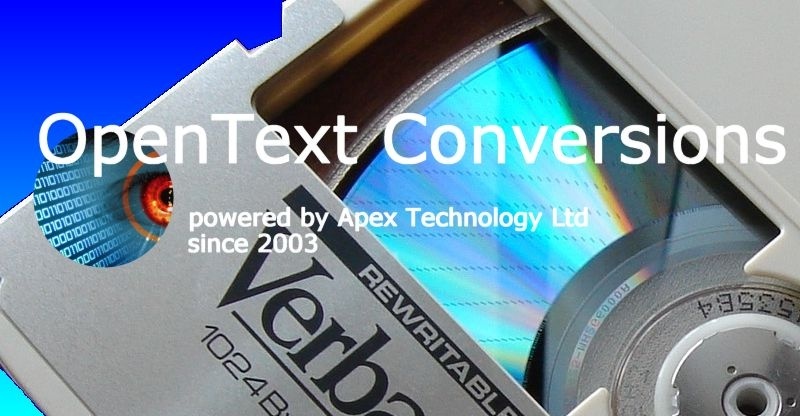 Some of the disks were no longer reconised by the OpenText MO drives, however we were able to extract the scanned documents, export the files to PDF and name them according to the document ID so they could be easily imported to the client's new system. OpenText used the Optical disks to provide easily expanded storage for the scanning filing system. If you need a OpenText MO Optical Disk Conversions service, then contact our friendly company. OpenText Conversions from MO Optical Disk storage Tower systems to export scanned document image files to PDF or TIF files. Some of the disks were no longer reconised by the OpenText MO drives, however we were able to extract the scanned documents, export the files to PDF and name them according to the document ID so they could be easily imported to the client's new system. OpenText used the Optical disks to provide easily expanded storage for the scanning filing system..